Five fishermen were rescued after floating in the sea near Koh Rin for 18 hours. 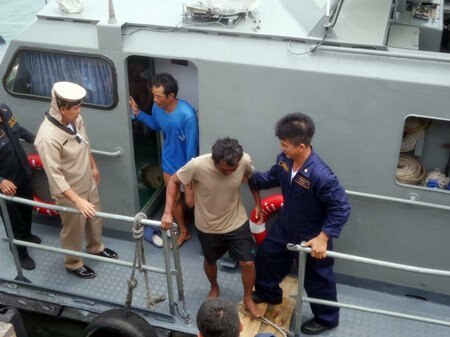 A Royal Thai Navy ship pulled the five Naklua-based fishermen from Pattaya Bay June 18. Three were found holding on to a 200-liter plastic barrel and taken to Bali Hai Pier. Two others that had floated away were recovered and taken respectively to Bang Saray and Naklua. All were treated at Banglamung Hospital and released. One of the men rescued, Bancha Uthama, 44, said his boat and crew of five left Naklua for Koh Rin June 17 to lay nets. Off the island, they were hit by a storm and the boat capsized, weighed down by its heavy, submerged nets. The boat eventually sank and the fishermen grabbed whatever debris they could and floated, hoping for rescue, for 18 hours. The Royal Thai Navy brings ashore fishermen who floated in the sea for 18 hours after their boat sank.